There are numerous ERP providers these days offering different software solutions and claiming that their offer is the best in the market. But this claims are not necessarily true. Moreover, some ERP solutions might really be one of the best in the market, but will they cover your company specific needs and serve you in a way that will support your business growth? Investing in the right ERP solution is a crucial process which involves people from different organization levels and departments in order to ensure that the new ERP solution will increase productivity, cut operating costs, boost efficiency, increase revenue, etc. [Step 1] Business Assessment: Why do we need an ERP system? Before even start searching for an ERP vendors you should ask yourself: Why your company needs an enterprise resource planning software (ERP)? Or if you are already using one, than what are the reasons for changing the old ERP with a new one? Make a wish list of all basic and specific requirements that you expect from the new ERP provider. Also make a list of your expectations regarding business improvements such as: better reporting tools, strategy evaluation, efficiency improvements, cost saving and control, growth and compliance. If you have already decided to purchase an ERP solution, you should appoint a team that will go through the whole process from the start till the end. Usually this team should be consisted of corporate officers and senior management but also should include relevant employees from different organization levels and departments in order to ensure that the new system will solve all existing problems. Give the leadership to someone who has a vast knowledge of the existing system and its problems. What do we need the system to achieve? The appointed team should examine our business processes and prepare a list of needed requirements that must be present within the new ERP. Consider the functionality and also adaptability and responsiveness of system to avoid higher consultants cost. What application area do you cover? Do you have structured implementation methodology? Do you provide local customer support in different countries? In the table you should write the score for each feature that a specific ERP Vendor provides. After you finish grading the features of the different ERP solutions, sum up the total score for each vendor. Write down the score for each ERP Vendor. After you finish, sum up the total score for each vendor. After summing up the results in the previous two steps (Step 5 & 6), you should compare the total score received for each ERP vendor. Consider the vendors with the highest scores and continue with the next step: Shortlisting 2-3 vendors and asking for a Demo presentation of the system. Shortlist maximum two-three vendors and then focus on the areas that are critical to your business. After narrowing down the selection process, ask the shortlisted vendors that understand and solve the problems, and to give you a demo presentation of the system they have. After selection of the best ERP Solution, next task is to initiate client-vendor relationship and begin the implementation process. This new process starts with finalizing the service contract, license and maintenance agreement. 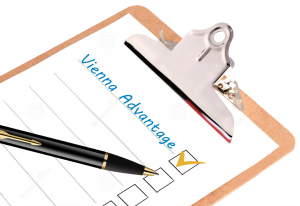 If you are in the process of searching for new ERP Solution, you should definitely check the integrated VIENNA Advantage ERP & CRM Solution. I agree that a process is needed for a proper evaluation. As someone who sits the other side of the table, having a pricing discussion before you understand how the technology can not just solve your challenges but also transform your business with new ways to be efficient could be short cited. You get what you pay for. Wouldn’t you want to see if a solution exists that could help make your business what you always wanted it to be? if you follow these steps, you might eliminate those solutions before learning anything about the technology. Price is important, but so is the results. I guess part of the requirements would be to determine the price/value ratio.